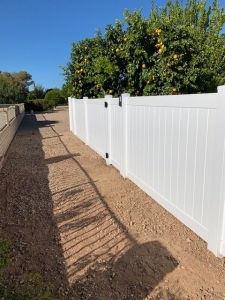 We recently began installing a new product of ours, vinyl fencing. 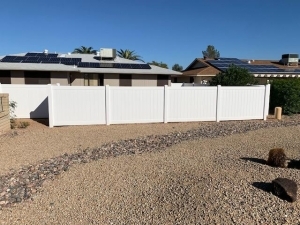 Check out our first ever vinyl fence installation below! Vinyl fences are great if you are looking to add a barrier to your yard for privacy. A vinyl fence also rquire next-to-no maintenance! Occassionaly due to the dusty desert climate here in Arizona, you may wish to hose down your fence to wash of dirt and debris. Not sure what type of fence is best for you? 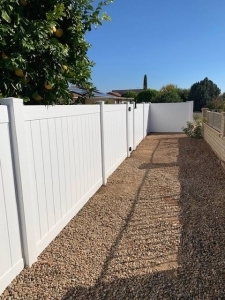 Our fence experts have over 18 years experience installing fences throughout Arizona. Give us a call to discuss what you are looking for and your priorities and we will match you up with the perfect fencing. Contact Arizona Pool Fence today for more information on vinyl fencing options and a free estimate!